In the hallowed land of barbecue legend, a former ice cream parlor heats up the battle for bragging rights. 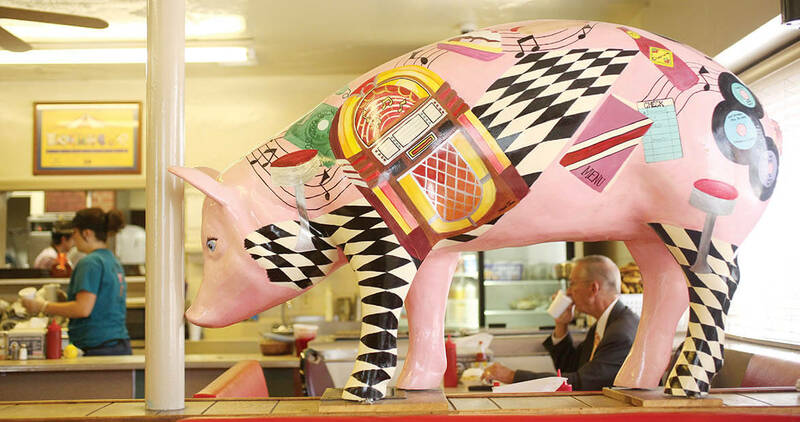 Lexington, North Carolina, is to barbecue what Paris, France, is to baguettes. When I was a kid, I imagined everyone in Paris walking around with a baguette or two under their arms, like Little League baseball bats in thin paper sacks. This turned out to be true, or sort of true, or at the very least kind of true: I went to Paris once, and I have to tell you, you will never see so many baguettes in one place in all your life. They call Paris the “City of Light” only because they crowd-tested the “City of Baguettes,” and it didn’t play as well. But Lexington does in fact call itself the “Barbecue Capital of North Carolina,” and not for nothing. Because with a joint like the Bar-B-Q Center within city limits, you can get away with it. And with an annual barbecue festival that, last year, drew more than 200,000 people and had Darius Rucker play for free? Please. Still, it’s a gutsy self-appellation. Especially since the Tar Heel state is split in half by those who prefer one style of barbecue over another. Barbecue novitiates may recall that one style is called “eastern” and that the other is called “western,” or, more commonly, “Lexington-style.” As in the style of how they do it in Lexington, and how they do it — expertly, I might add — at the Bar-B-Q Center. The Bar-B-Q Center is one of the best-known barbecue joints, not just in the state but in the country. It’s on Main Street, not far from Interstate 85, on a rise just before heading into town. If you’ve been on Main Street in Lexington anytime in the past 50 years or so, you know where it is, because it hasn’t moved or even changed that much since it got there in 1955, even though everything around it has. There’s a storage center across the street, and an automotive center nearby, too, but they’re babies in the neighborhood compared to the Bar-B-Q Center. What a joint this is. Even vegetarians should give it a visit. There are places in the world that feel as if they’ve been passed over by the dulling effects of time, rescued from the past for presentation in the present. The Bar-B-Q Center is a place like this. Its iconic neon sign should be sheltered in the Smithsonian Institution one day, next to Julia Child’s kitchen. The redbrick and cinder-block building is sturdy, perfect in its simplicity. A wolf could huff and puff and never blow it down. The pigs cowering within would be entirely safe. It’s not a big place. The restaurant seats approximately 100 people, but even when it’s full, it doesn’t feel crowded — probably because there are so many booths. There’s something about snagging a seat in a big, comfortable booth that makes a body feel taken care of. There’s a long row of red vinyl-covered stools along the counter where the solitary can sit. Here you can watch the large-screen television mounted near the ceiling, or gawk in wonder as half a dozen waiters and waitresses and cooks artfully negotiate a space not much wider than a balancing beam. One waitress I interviewed on deep background did admit that it was tight back there and occasionally you might have a friendly collision or two, and then she filled up my diet soda. The Bar-B-Q Center has been owned and operated by the same family since 1955. It started out as an ice cream store, but one winter — the season when ice cream sales take a dip — they put a pork shoulder on a pit, and the rest is history. 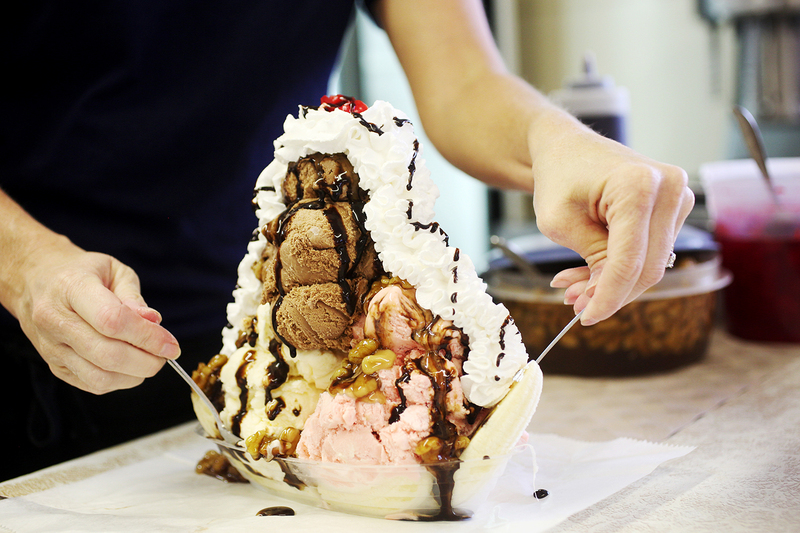 They still sell lots of ice cream — at least 200 gallons a week, much of it going into a ridiculously huge 3.5-pound banana split, which this intrepid reporter was not intrepid enough to try. Though the old Dairy Center is now the Bar-B-Q Center, ice cream is still part of the experience. In fact, the banana split alone is enough to feed a family. Sonny and Nancy Conrad ran the restaurant for decades, until Sonny died last year. Nancy still works, but the day-to-day running of the business falls to her sons, Michael and Cecil. In an online posting, Michael Conrad writes that he sees barbecue as being one of the few remaining professions where knowledge is passed down from mentor to apprentice, over time, through direct experience. You can’t learn to cook barbecue, he argues: You have to live it, and from what I’ve learned as barbecue correspondent for Our State, I think this is the truth. The pit masters I’ve met haven’t just taken it up as a hobby or a second career: It’s been a part of their lives in one way or another from the get-go. Cecil’s kids were working the counter when I was there, it being summertime and school was out. They’re 14 and 12. But Cecil did get out of the business for a while. He went away for five years and got his master’s in sports medicine. He says he always knew he’d come back, one day, even though his father never pushed him to — “he nudged,” Cecil says. The only big change Cecil and Michael brought to the joint happened last year, when they replaced the original pits with new ones, expanding the kitchen. The new pits are beautiful, airtight; the hot, orange coals glow like a thousand setting suns. And the pork shoulders that come out of them are tender; the meat falls off the bone. You need to experience barbecue straight from the pit, cooked by a pro — it’s like tasting spring — it’s still great when it gets to the table. It’s moist, tomatoey, a little smoky. Follow it with the red slaw for a superior barbecue experience. In the ’60s, Main Street in Lexington was a popular place to cruise, so the Bar-B-Q Center had a very popular curb service. The hot rods used the parking lot as a turnaround, and back and forth down Main Street all night long. Sonny tired of it, though, and installed a metal railing to keep the ducktails out. He had nothing against them, but he knew, with the wisdom displayed by barbecue’s early settlers, that he wanted his to be a family business, and that’s exactly what he got. And they still have curb service. So, the Barbecue Capital of North Carolina? I’d go even further. I’d say Lexington is the Mesopotamia of North Carolina Barbecue. Not that barbecue was born here, or invented here, or that without it we wouldn’t know what to do with a pit of hot coals and a pork shoulder. Good barbecue is everywhere. But there is something similar about the North Carolina Piedmont and the Fertile Crescent of the Tigris and Euphrates river basin: Civilization comes from one, and barbecue comes from the other.